Today, I decided to cook for myself. Create something selfishly just for our dinner. No guests, no hosting, just us + creativity & presentation. Often when a hobby turns into a career, you forget to indulge in a little of it for yourself. So I sat with my coffee and started pondering over my list of recipes-to-tweak-and-try (yes, I have lists for everything! ), and this happened. I doused a moist steamed chicken Siu Mai (a kind of chinese dumpling) with basic Butter Chicken (a popular north indian chicken curry) sauce and served it [to ourselves!] as an appetizer. You're pretty darn famous, that's my hunch! Asparagus might come & go, but you just stay.."
One of my biggest discoveries after moving to the US was how conscious people are about what they eat. At first I thought it was a fad. But as I scanned grocery aisles, read unfamiliar brand names and suffered a few allergic reactions, I began to understand why people were so particular. Unlike Asia, where packaged food still has limited use in households and is very much limited to commercial dining, the US pretty much runs on it. And with that comes the safety associated with food labels. Thus, I'm always on a mission to create at home all that we see & love at restaurants - like these delectable mini taco shells! Eggs, unfortunate for me as others say, have never been my favorite. Call it a grudge I carry from boarding school, or the sharp unique smell that has me staying miles away. But I do like experimenting with them - because they're so versatile, amazing in baking & can be adapted to taste. I noticed that if you sneak in a little masala into a regular egg recipe, it makes them much more [for me that is] palatable. In the past I have baked a few brownie bites, scrambled some in my weekday fried rice, whipped up some quick macaroons, made my husband's favorite brunch frittata & even made a jar of mayonnaise, but these bite-sized appetizer with a filling of subtly spiced boiled egg salad made me reach for seconds. Yes, me! You could just be lazy and use store-bought taco shells, but the marriage of slightly Indian [almost samosa like!] crust with a spiced eggs is one that, I believe, will make it through the tough times. But hey, don't take my word for it. Try the recipe and decide for yourself! Mix the flour, salt, soda & carom seeds. Add the oil and mix with your fingers till it reaches the consistency of course sand. Add water, little at a time, and work into a smooth dough. Cover with a damp cloth and let it rest for 30 mins. Roll out the dough into a thin round and cut out 2-3" circles using a cookie cutter [the size depends on how large you'd like your tacos to be]. Coat with a little oil and line them up on a wire rack [see pic] so as to let them bake in a taco shape. Bake at 400 F for 10 minutes, till the shape is retained, and then drop into the hot oil for a quick fry. Drain on a paper towel and keep aside. Mash the eggs well with a fork and mix with the remaining ingredients. Adjust seasoning and then add a dollop of the mixture into the taco shells. Sprinkle with paprika before serving. A simple & delicate way to entertain a crowd. The recipe works so well for a canape brunch, or a simple cocktail party! This is my life, the one I always sought..."
Working in the Investment Banking world was tiring. But only till the day I decided to swap it for a frying pan. Running your own business, specially one related to food, is not child's play. From a multi-person corporate support system, you're suddenly down to being your own admin, sales, technician, social media specialist, event organizer, caterer and... dish washer. Hours of standing, less than plump pay checks, no public holidays and always having to smell of food are truly balanced by the little things my guests do. They don't know it, but every tiny gesture goes a hellafa long way. That request for a signed menu, laughing at my attempted jokes, an almost standing ovation, a flattering blog post or a simple gratifying smile - these are the things that make me do what I do. These are the things that make being a chef worthwhile! And if it isn't already fun enough, along comes the visiting best friend who happens to also be a brilliant photographer. In a month that is swamped with dinners & events, I could think of no better way to show my love, than to make her work a little ;). Below is proof of the stunning genius that she is, a master of capturing every tasty moment! Oh, and she also makes a remarkable sous chef! Do give Gayatri Nair Photography a look, and for those about to get married, you should know that you need her there for your special day. Some people call my work face serious. I call it focus for deliciousness. Happy Thursday! Check out some recent reviews of my dining experiences via Sanura Weathers on her award winning blog: My Life Runs on Food & Ohneka Farm's most talented blogger: Navriti Sood. 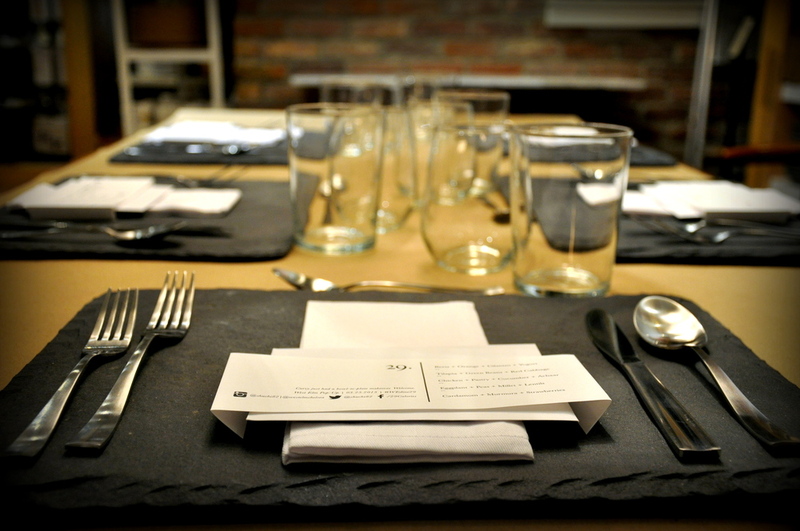 Contact Me to setup a private tasting or visit Events for upcoming dinners in NYC. Of food, colors, and the week that's been..."
It's been one busy week! While I work on the recipes, here are some pictures from all the adventures this week. If only these could fill you up eh! Come try my food at one of the upcoming dining experiences! Got a large group? No problem! Contact me to discuss a private tasting.